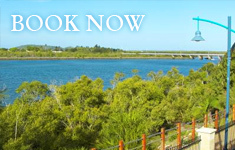 The Mid City Motor Inn is located one block from the Mackay city centre and backs onto a georgeous 3km boardwalk along the Pioneer River. The motel is an ideal base to explore the city, nightlife, restaurants and shops. Set midway between Brisbane and Cairns, Mackay makes an ideal holiday stopover, short break escape or meeting place for business. The Great Barrier Reef, fantastic fishing and scuba diving are all on our doorstep. Enjoy the many beaches and the Bluewater Lagoon, complete with waterfall, waterslide, fulltime lifeguards, undercover areas, barbeques and cafe.